Bonodrumming.com began as a joke on the critically acclaimed U2 Chatcast (episode 4). 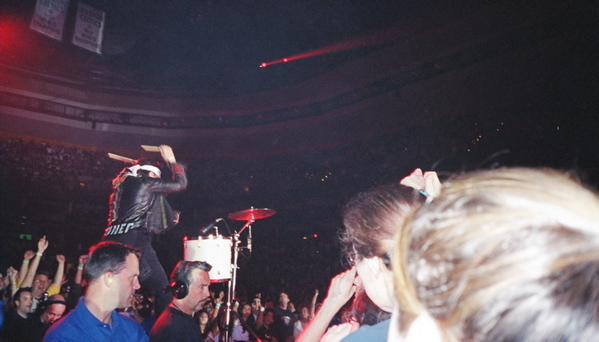 Fans discussing the recent Vertigo tour were amazed by how many concertgoers were injured by other concertgoers lunging toward them to get a good photo of Bono drumming during "Love and Peace or Else." It was apparent that Bono drumming must be the single most significant aspect of U2's existence in rock and roll today. Moved by this revelation, Michael and Tassoula felt it was their civic duty to bring this subject to light. To provide a community for this band of brothers and sisters, so unified by one common passion. So there you have it - a web site is born. A home for fans of the crazy samurai. A safe haven for obsessives that can't get enough of the drumming. A resting place for Vertigo refugees.